Remote driving comes a step closer | What Car? Remotely controlled cars have moved a step closer to reality, after the latest test of a multi-vehicle road train was carried out. The Safe Road Trains for the Environment (SARTRE) test involved a lead control truck and three following cars. These cars are controlled by the truck driver and driven autonomously at speeds of up to 56mph, with no more than six metres between each. 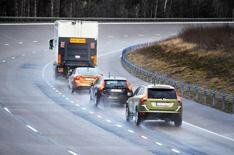 Technology from the SARTRE project is being developed to allow such multi-vehicle platoons to travel on conventional highways alongside traditional road users. The Europe-wide project is also looking at infrastructure changes to the continent's road network that would be required to make such a 'platooning' scheme possible. Stakeholders including technical experts, politicians, legislators and traffic safety researchers have held a series of workshops to discuss legal regulations, product liability and driver acceptance of automated vehicles. The SATRE project claims that road trains promote safer transport because the vehicle platoons are led by a professional driver, while environmental impact is cut because the cars are so close together which lowers drag and improves efficiency by up to 20%, according to SARTRE. 'The successful completion of the first multiple vehicle tests of the SARTRE system is a significant achievement,' said the SARTRE project director, Tom Robinson of Ricardo UK. Project partners hope to extend the project to four cars and a lead truck by autumn 2012.